Pictured are Park’N Fly’s Grand Prize winners Mr and Mrs John Boyce. 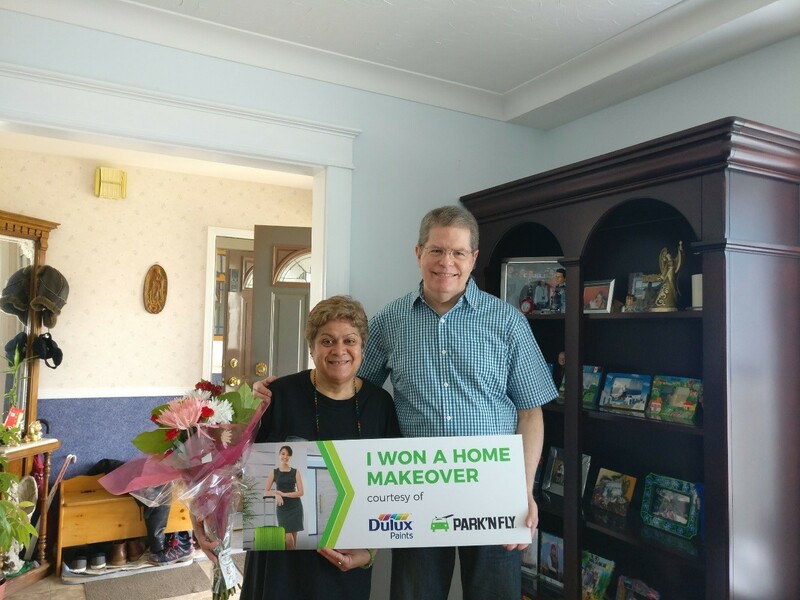 Toronto, ON Canada, 2018-May-07 — /Travel PR News/ — Park’N Fly is thrilled to announce the Grand Prize winner of our Home Makeover contest. Mr. John Boyce of Toronto won a 2-hour in-home colour consultation, up to 60 hours of painting service and $1,000 CAD in Dulux paints and supplies. John and his wife Laura are currently planning how they will use their home makeover prize and will begin work in their home this summer. Mr. Boyce’s name was randomly drawn from over 22,800 eligible entries on April 5, 2018. Entries consisted of ballot entries submitted through the contest website between February 15 and March 31, 2018. CAA Members also received one automatic bonus entry with each stay at a participating Park’N Fly locations during the contest period. The approximate value of the Grand Prize is $4,000 CAD. In addition to the Grand Prize, 2 secondary prizes each consisting of one 8-day parking voucher were also awarded. Secondary prize winners are CAA South Central Member Mike Vander Doelen from Oakville ON and BCAA Member Arthur Self from White Rock, BC. Each won an 8-day valet parking voucher valued at $120 CAD each. A Canadian operated company with over 40 years of airport parking experience, Park’N Fly has earned the reputation for providing cost effective services for both business and leisure travellers. Park’N Fly is Canada’s premier off airport parking provider, whose footprint spans the Canadian landscape, from coast-to-coast. Today, operating in 7 markets nationwide, Park’N Fly offers consumers a choice of parking solutions, tailored to meet every traveler’s budget. In addition, Park’N Fly also offers additional value added services such as detailing and oil changes. For more information, visit parknfly.ca. This entry was posted in Airports, Transportation, Travel, Travel Marketing and tagged airport parking, John Boyce, Michelle Harris, parking, Park’N Fly. Bookmark the permalink.